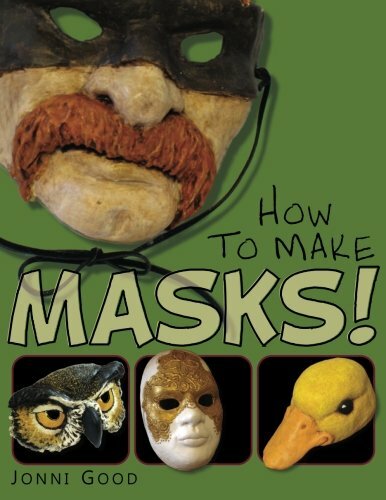 This book teaches new techniques that anyone can use to create fabulous masks easily and quickly. Make one of the 12 popular mask styles in the book following the detailed instructions and over 300 step-by-step photos – or use these easy new methods to create your own unique designs. Jonni shows you exactly how to sculpt the features of your masks so they truly represent the character and expression you’re looking for. Then capture that look permanently with just two layers of super-strong, fast-setting paper mache, using the recipes included in the book. Your finished masks can look like they were made from fur or feathers, antique gold, ancient bone, rusted iron, glazed porcelain, and even carved and highly polished African wood. The innovative methods in this book are easy, the materials cost just pennies per mask, and your new creations will be just as much fun to make than they are to wear.